Lobby group AfriForum said on Wednesday that it has learnt that a warrant of arrest has been issued against former Zimbabwean first lady Grace Mugabe. 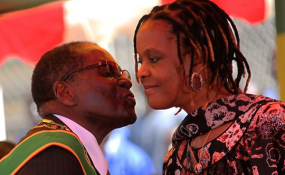 Mugabe is accused of assaulting South African model Gabriella Engels at a hotel in Sandton in August 2017, allegedly with an electrical extension cord. Pictures on social media appeared to show Engels bleeding from the head after the alleged assault at the hotel in the upmarket business district. Mugabe was granted diplomatic immunity by the South African government at the time, which led to her departure from the country after the incident. In 2009, a photographer accused Grace of beating him up in Hong Kong. AfriForum CEO Kallie Kriel said that "nobody is above the law, and everybody should be prosecuted when they transgress laws of the country".